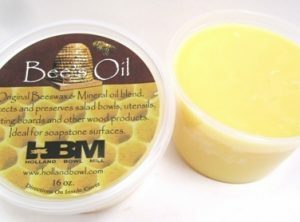 To preserve your wood bowls and the other wood products you cherish, try our famous Bee’s Oil Salad Bowl & Wood Preserver. Bee’s Oil Wood Preserver is completely food safe, made only from food-safe oil and beeswax. It penetrates the wood and leaves a soft protective luster to all wooden products. It is easy to use and smells wonderful. 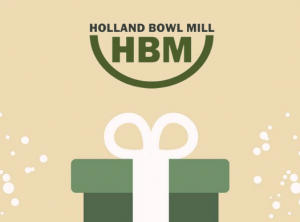 Holland Bowl Mill has received many letters from customers telling us that Bee’s Oil is so gentle that they use it as their favorite hand cream moisturizer. Give our Bee’s Oil a try. We offer an unconditional money back guarantee if you are not satisfied for any reason. You can place your order securely from this shopping cart using your credit card or call us at (616) 396-6513 to place your order. When ordering from Canada, please visit Sculpture Supply Canada. 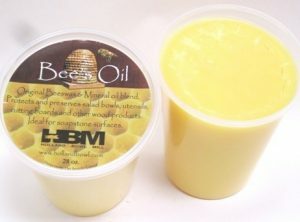 They are a distributor of our Bee’s Oil across Canada. SSC can process and ship Canadian orders via UPS. They operate as a storefront in Toronto, ON and offer online sales. 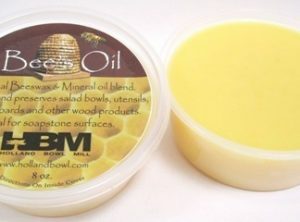 Here is a link directly to the Bee’s Oil on their website.